The Cleveland Indians beat the New York Yankees 9-8 to take a 2-0 lead in the ALDS, coming back being 5 runs behind. Everyone in New York is blaming Joe Girardi for the collapse, and perhaps they have a point. After Greg Bird hit a 2-run homer in the 5th, the Yankees went up to 8-3, and looked comfortable, ready to tie the series before heading to New York. No one was blaming Girardi for the game 1 loss (4-0 Indians), as it looked like simply a case of two mismatched teams. But game 2, at least the first half of it, brought new hope to the Yankees and their chances of upsetting the best team in the American League trying to make it back to the World Series. The decision that bothers everyone the most is Joe Girardi not challenging Lonnie Chisenhall and the hit-batter call in the 6th inning. Replays showed there was no ‘hit by pitch’ call and actually Chisenhall changed direction with the tip of his bat, but Girardi didn’t do anything about it, and the collapse began. Francisco Lindor hit a grand slam home run, Jay Bruce tied the game in the 8th and in the 13th inning Yan Gomes hit a walk-off single to the left. Girardi said they didn’t have time to challenge, and considering Brett Weber, their replay specialist, led the majors in overturning results it’s a reasonable explanation. However, Girardi also said he didn’t want to get Chad Green out of his rhythm, which makes a lot less sense. But the decision that made the least sense was pulling CC Sabathia out of the game despite his performance. 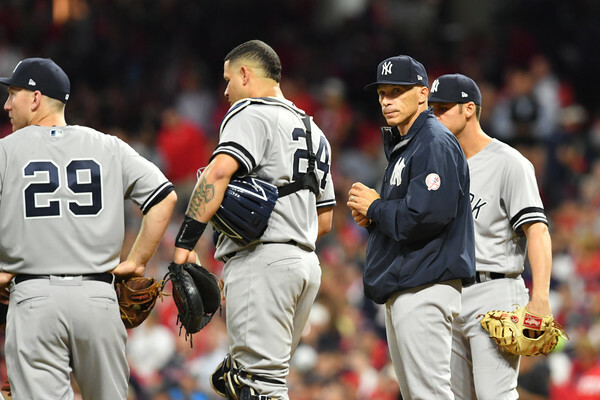 With five innings and one out behind him, Girardi stuck to his plan before the game instead of going with what he was seeing, which was Sabathia dominating from the 2nd inning moving forward. He threw only 77 pitches, retiring 12 of the previous 13 batters, and had one player on and another one out before he was taken out. Instead of putting Green on in the 7th, Robertson in the 8th and Chapman for the 9th, Girardi lost his lead, and ended up using Chapman for two innings, Robertson for almost two, Tommy Kahnle and finished with Dellin Betances, also throwing for two innings before allowing Gomes to win the game. The Yankees were very close to being at 1-1. Some would say they deserved it, although their home run machine, Aaron Judge, is still hitless in the series. However, they’re heading back home with their first back-to-back losses since August, knowing very well they had the Indians where they wanted and they let them get away. There’s always plenty of blame to be thrown around, but in this case, their manager deserves most of it.